I’ll never be making paruppu (Dal) the same way anymore. In doing this state-wise blogging marathon, I’ve realized that paruppu (dal) features in almost every state but with just a tiny twist here, a little tweak there. And these tiny twists and tweaks do wonderful things to the un-assuming paruppu. 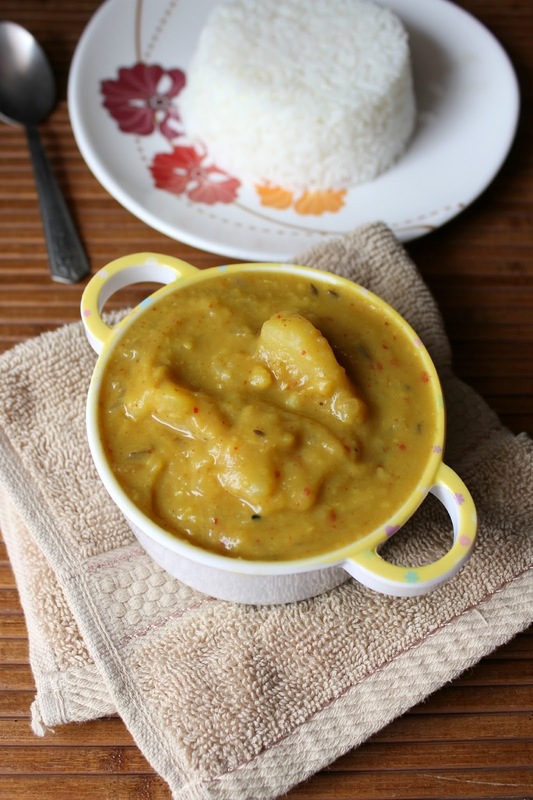 The Dalma (adapted from here) is Orissa’s, sorry Odisha’s way of making dal – toor dal cooked with potatoes, eggplants and a dash of ginger and topped with ghee tempered panch phoran. Panch phoran is magical – I absolutely love the 5 of them. Yuvi enjoyed his rice and dalma and that is saying something. Till recently, he’s have his afternoon meal while riding his cycle. I’d wait while he has a bite and then cycles down the road, turns around and cycles back. With the Dalma, he did not dodge me while turning around. When he’s feeling particularly wild or doesn’t like the food, he likes to come near me but swiftly swerve away before I can thrust in the spoon. I’ll definitely be making Dalma again. Odisha is an ancient land, as old as the Mahabharata. It lies on the east coast of India above Andhra Pradesh and below West Bengal. Odiya or Oriya is the language spoken there. There are several wildlife sanctuaries in Odisha that are popular tourist attractions. From what I read Odiya people are dessert lovers – chhenapoda, rasgulla, chhena jheeli, kakara peetha are sweets made in Odisha. The Chhenapoda has been on my to-do list for quite some time now ever since some of my blogging friends posted it. They really aced it. I need to try it too. 1. Rinse dal in 2-3 changes of water and transfer to a pressure cooker. Throw in the cubed potatoes, quartered brinjals, ginger paste, green chillies, salt, turmeric powder and sufficient water. Pressure cook till the dal turns soft – about 15-20 minutes. Set aside. 2. Dry roast the whole dry red chillies and cumin seeds on low heat for 3-4 minutes. Cool and grind to a fine powder. Set aside. 3. Heat a pan. Add the cooked dal and vegetables. Stir in the ground spice powder. Add a little water if you want to thin the dalma. Stir and cook for a couple of minutes on low heat. 4. Heat another small pan and add the ghee. Drop in the panch phoran – mustard seeds, cumin, fennel, nigella and fenugreek seeds. Once they pop, splutter and have slightly coloured pour the entire tempering mixture ghee and all over the dal. Switch off. Mix well. Serve with steamed rice and vegetables. 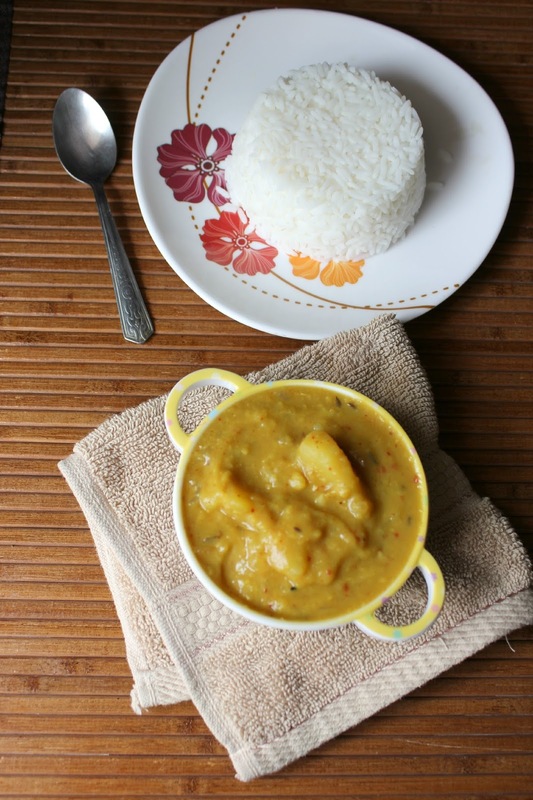 This entry was posted in Dals, Kormas & Gravies and tagged Blogging Marathon, dal, dalma, gravy, lentil dish with rice, odiya dalma, oriya cuisine, oriya food, recipe. so beautifully made!!! love this dalma!! Daalma has been on my to do list since long..somehow I postpone it. .but your version looks cool..willl try. Nicely made…… Looks interesting and delicious!! There are so many variations of the simple dal, one in every state. Dalma looks lovely. 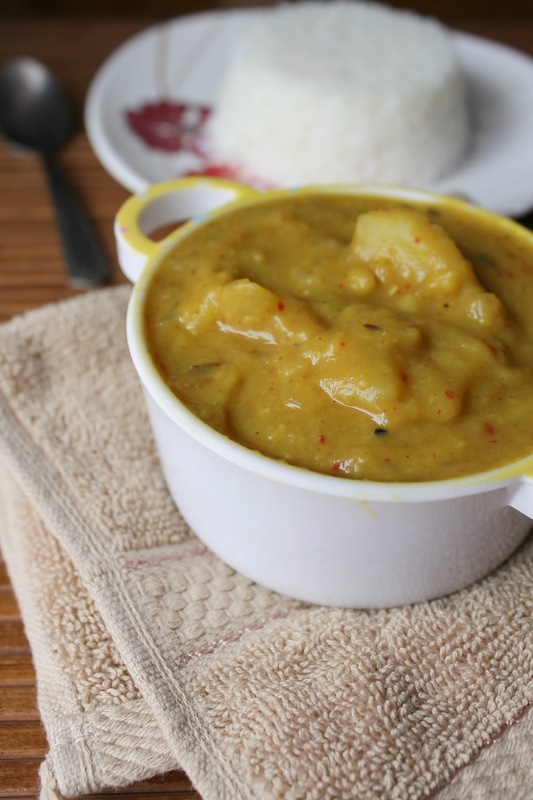 A popular dish of Oriyacuisine, dalma looks simply delicious and definitely a comforting food. N also my kids too live dal.thatz the most interesting part to cook dal.This looks yummy n interesting recipe. I agree the dal has been redone in so many ways across the states…:)..your dalma looks so inviting Jayanthi..
That sounds like a delicious dal from Orissa.. It is kid approved to boost. So many variations of Dalma. This one sounds just as flavorful! wow this version dalma looks fantastic and very comforting 🙂 absolutely delicious !! Very well presented dish ! Beautifully presented.I love the flavours in it.